Véronique Dallaire, 33, was diagnosed with multiple sclerosis in June 2016, after having vision problems affecting her left eye. That same summer she registered for 300 hours of yoga training with the hopes of becoming a yoga teacher. Despite being diagnosed with MS a few weeks before the training began, Véronique decided to continue with her training, which she had been planning for some time. To this day, she has no regrets about her decision as it helped speed up her acceptance of her diagnosis and laid the foundation she needed to carry out the work she is so proud of today. In addition, her yoga and meditation training and workshops allowed her to undertake an inner journey encompassing both her body and mind. When her daughter Nora was born, Véronique didn’t know yet that she had MS. However, when she thinks about it today, Véronique remembers that she had a very difficult time after giving birth. After being diagnosed with MS, she wanted to be a mother a second time, even though she knew she could have an MS flare-up following the birth. She and her husband decided to go ahead anyway, while being well aware of the potential difficulty Véronique might face after the birth of their second child. With perseverance and strength, little Charlie was born on February 6, 2018, and Véronique did not have a flare-up afterwards. “I will never regret our decision to have a second child,” she says. “For the moment, I haven’t adapted my lifestyle, and that may be the problem. I have to learn to slow down. However, I’m beginning to recognize the warning signs and pay close attention. I still work full time, and now I have a business and two young children. There are many demands that I have to juggle,” she explains. Fortunately, Véronique has a supportive husband, who looks after a lot of things related to the children and their home. Upon reflection, Véronique finds that her husband has probably changed his way of life more than she has since she was diagnosed with MS. She is becoming more and more aware that, without him, she would have to drastically change the pace of her life. Véronique says that her diagnosis has totally changed her perception of life: “Thanks to, and I do mean thanks to, MS, I realized that if I didn’t [open my yoga centre], I might not be able to do it in five or 10 years from now.” Consequently, she embarked on the adventure and opened Dandelion Yoga Centre in fall 2017. 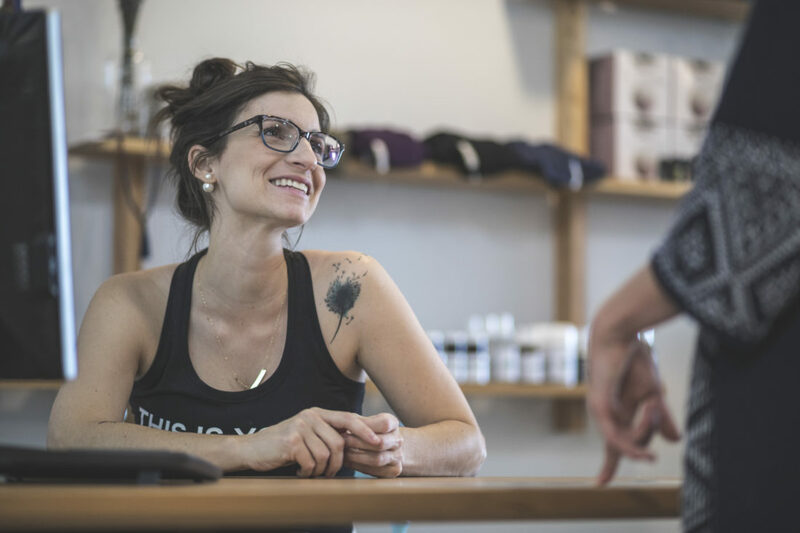 The idea of opening her own yoga centre surfaced when Véronique realized that there was nothing available for people with disabilities. She herself had to change the way she does yoga as she is no longer able to do hot yoga because of the symptoms she experiences in the heat. She decided to turn to a softer and less athletic practice of yoga, providing accessible classes in an inclusive environment. Her centre offers courses for people living with MS, those who are hearing impaired, and those with reduced mobility. The mission of Yoga Dandelion is to make yoga accessible to everyone, because, according to Véronique, it is not the student who should adapt to the teacher’s teaching, but the teacher who should adapt to the student.